The Flex-Ability series is ideal for solos, duets, trios, quartets, or any size ensembles, including woodwinds, brass, strings and percussion. Players of various abilities, levels 1--3, can play together. An optional play-along CD is available separately. 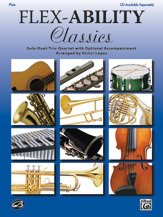 The 11 "classical" themes come from opera, symphony, piano and lute compositions, but are arranged in rock, jazz, swing and other contemporary styles. Here is a fun way to learn about these classics. Composer biographies and program notes are included. Titles: Overture from the Opera The Barber of Seville * Bourée from Lute Suite No. 1 * Habañera from the Opera Carmen * Theme from Hungarian Dance No. 5 * Minuet from Anna Magdalena Bach Notebook * Theme from The New World Symphony * Ode to Joy from Symphony No. 9 * Theme from Pomp and Circumstance * Prince of Denmark's March * Toreador from the Opera Carmen * Overture from the Opera William Tell.